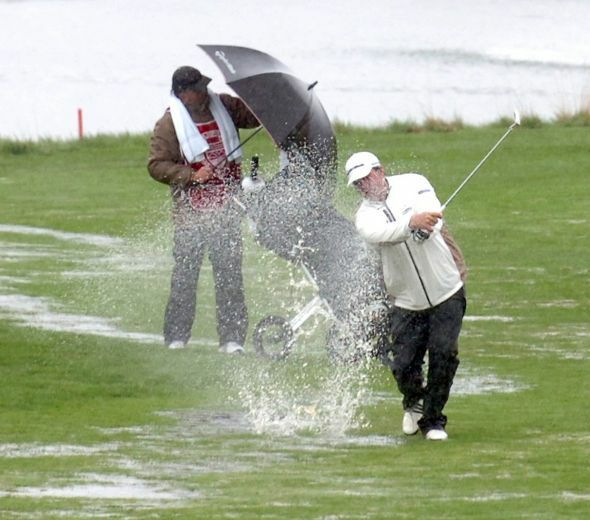 Even for the most experienced golfers, playing in wet conditions will present a whole new set of challenges. Rain alters your grip, visibility, comfort, and the course itself. However, if you’re properly prepared, there’s no reason why a bit of rain should hinder your performance and your enjoyment of the game. The best rain suits made specifically for golfing in wet weather will not only keep you dry, but won’t restrict your swing in the process. While these items are generally costly, it’s a good idea to invest in a jacket, pants, and headgear which is designed to stretch while keeping you cool and dry. Make sure that it’s lightweight and adjustable if needs be. This may seem like an obvious accessory to mention, but a good quality umbrella will keep both you and your equipment protected from inclement weather. Be sure to purchase a strong umbrella with a large canopy, preferably with double layers to allow airflow without it turning inside out. Good quality grips will ensure that your clubs don’t become slippery when wet, as you could easily send your club down the range if you aren’t careful. Some grips perform better than others when wet, so make sure to invest in grips which work equally well in both wet and dry conditions. You wouldn’t guess on NRL premiership odds, so don’t guess that your grips are suitable either! Be sure to carry two or more pairs of gloves with you at all times, just in case one pair gets soaked through. You may also want to invest in rain gloves which are designed to dry quickly and maintain grip when wet. Waterproof shoes are absolutely imperative when it comes to golfing in wet weather and pack an extra pair of dry socks kept in a sealable plastic bag. Goretex is a quality fabric which is breathable, but still protects your feet, so be sure to look out for golfing shoes of this type. If only a light drizzle has been predicted, you may not feel the need to pack a bag full of wet weather accessories. In cases such as these, grip lotion is your go-to option. It will help maintain grip and should last several hours. Your clubs need to be kept dry as well so be sure to outfit your bag with a waterproof hood. Explore all the options and purchase one that is lightweight, detaches easily, and fits your bag snuggly. You can’t have too many towels when it comes to a round of golf in wet weather and these should ideally be kept in sealable plastic bags to protect them from the elements. You won’t only be using them to dry your face and hands, but likely also your clubs and seat of your golf cart, so be sure to pack plenty! Happy wet weather golfing.